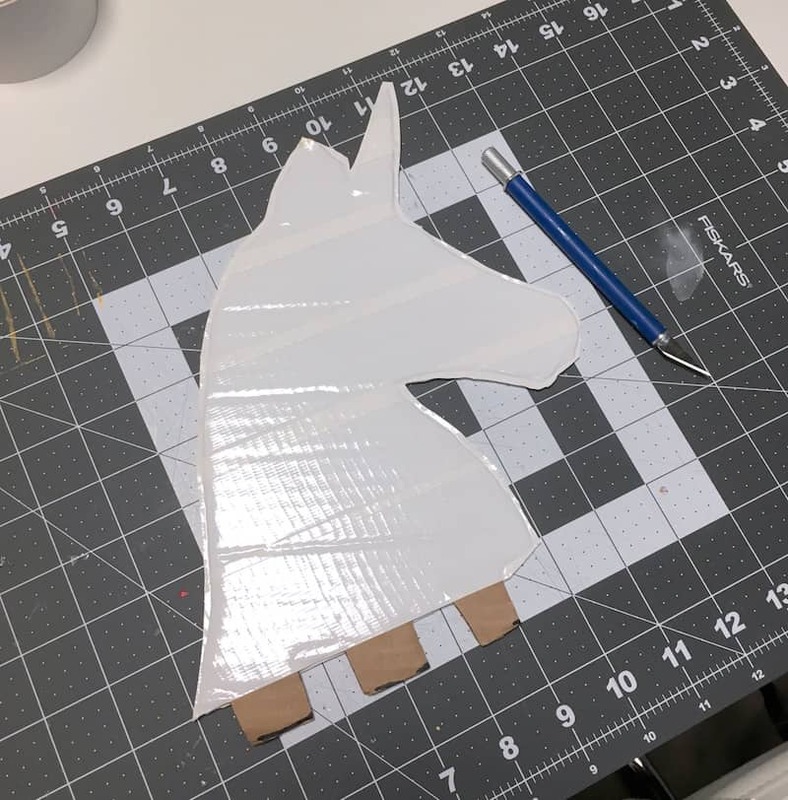 Learn how to make a very unique unicorn valentines box with Duck Tape! 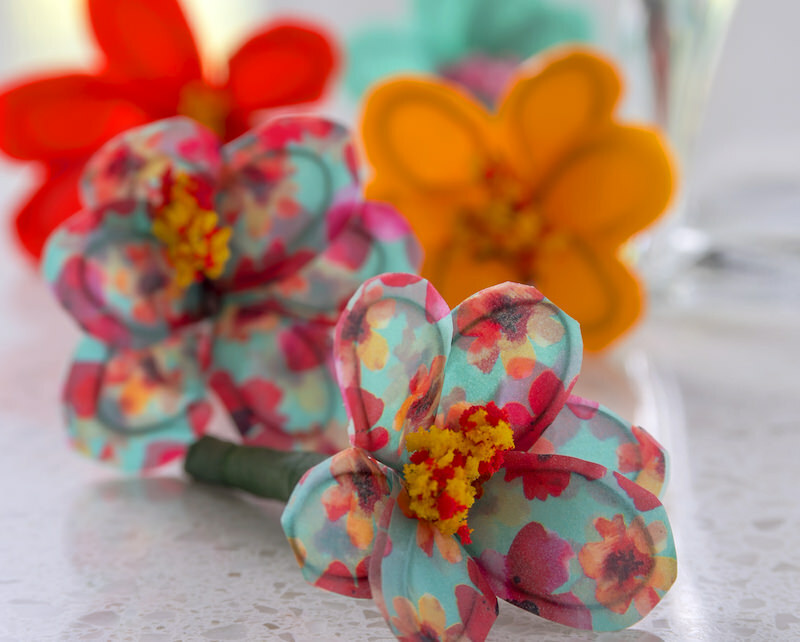 Grab a shoebox and the free patterns – kids will love to make this! I remember one of the greatest joys of my elementary school career came around the first week of February every single year – making my valentines box! I’ve never been into the romance aspect of Valentine’s Day, but I’ve always loved the crafts. There are so many reasons! I’m not really a pink and red person, but you get to go “all out” with those colors for Valentine’s Day. Same with glitter. I like to keep my glitter usage around the holidays, and Valentine’s Day is the perfect time to use it! But back to my valentines box. I’m loving the unicorn trend this year, and I had to make a unicorn valentines box. My little neighbor Audrey is going to take this one to school! 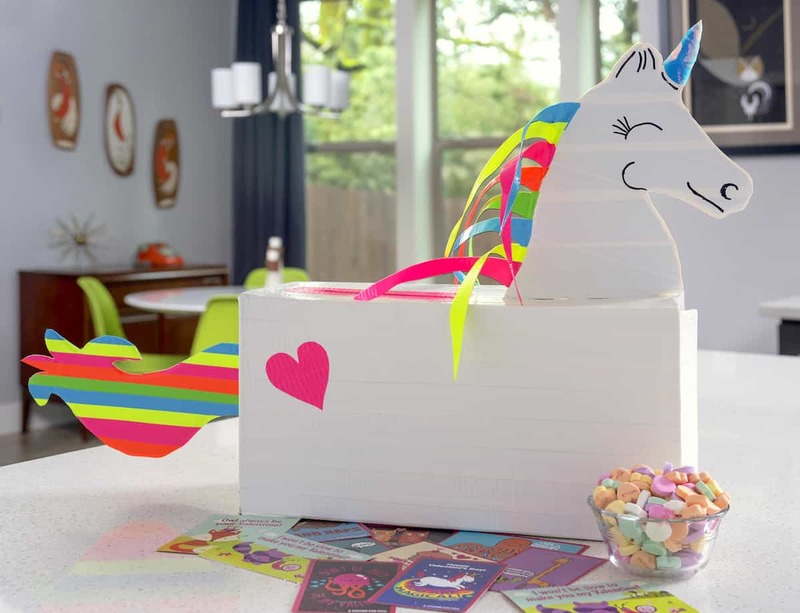 She’s all about unicorns, so this DIY unicorn valentines box is perfect. It’s really easy to make with Duck Tape too. If you love crafting with your children, this is the perfect Valentine’s Day craft to make together! One last note . . . I have two special things to call out about this unicorn valentines box. The first is I’m giving you templates for the head and tail so you don’t have to do those yourself. The second is that this project uses the Duck Mirror Crafting Tape which is FABULOUS if you haven’t used it yet. It’s perfectly hologram for unicorn crafts. I love it so! Here’s how we made this DIY valentines box. Start with an adult sized shoebox. 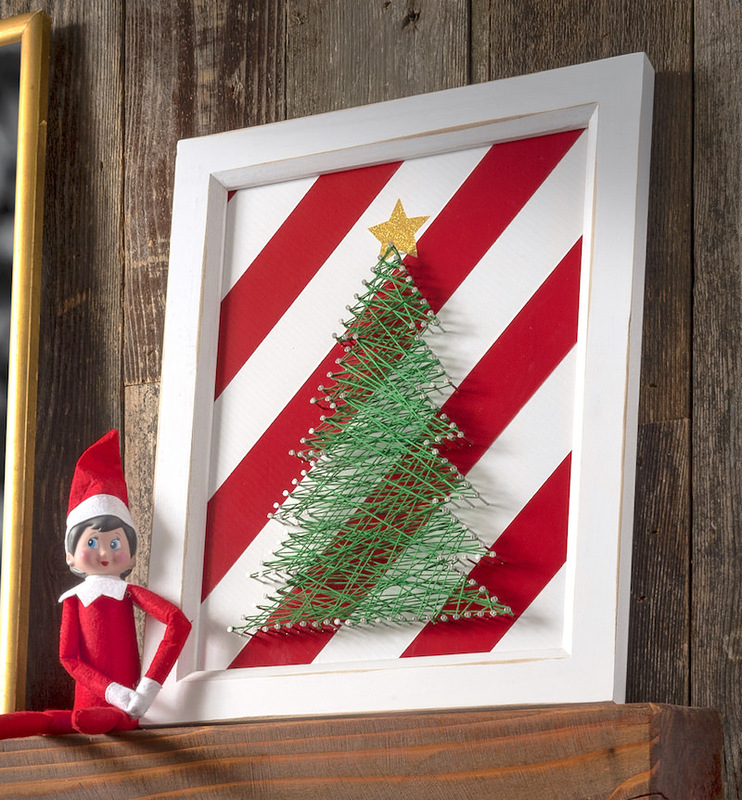 You can also make this project with a small shoebox, but you may need to reduce the size of the templates I provide. I recommend using the box with the lid on one side (so that it’s taller that wider) so that you can easily remove the valentines when the time comes. But I’ll leave that up to you! 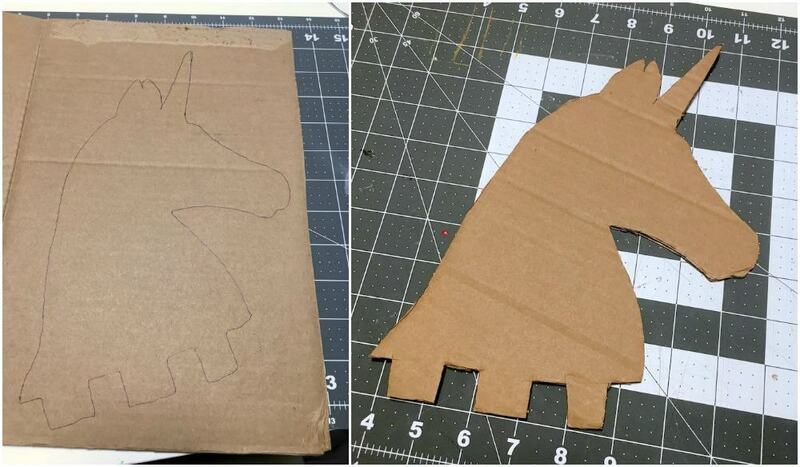 Print out the templates for the unicorn head and tail (get them here) and trace onto a piece of cardboard. 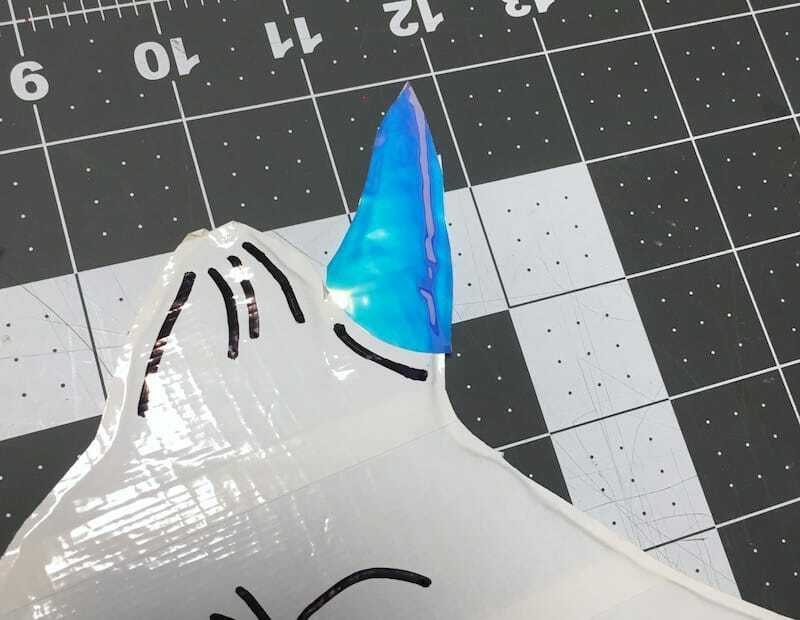 When you trace your unicorn head, add 2 – 3 tabs at the bottom so that you’ll be able to insert them into the box for stability. Cut out. 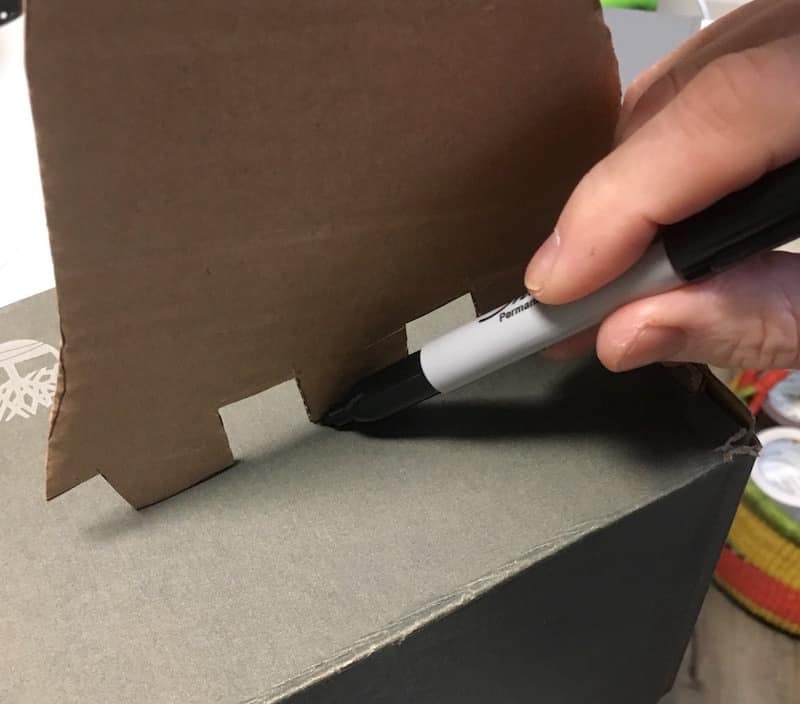 Trace lines on the top of the box where you are going to insert the tabs. Pierce the end of the box with a craft knife where you are going to insert the head and then insert to make sure it fits. Remove the unicorn head again. Tape the entire valentine box with white Duck Tape, including the lid. Make sure to use your craft knife to cut the lines to insert the head again. 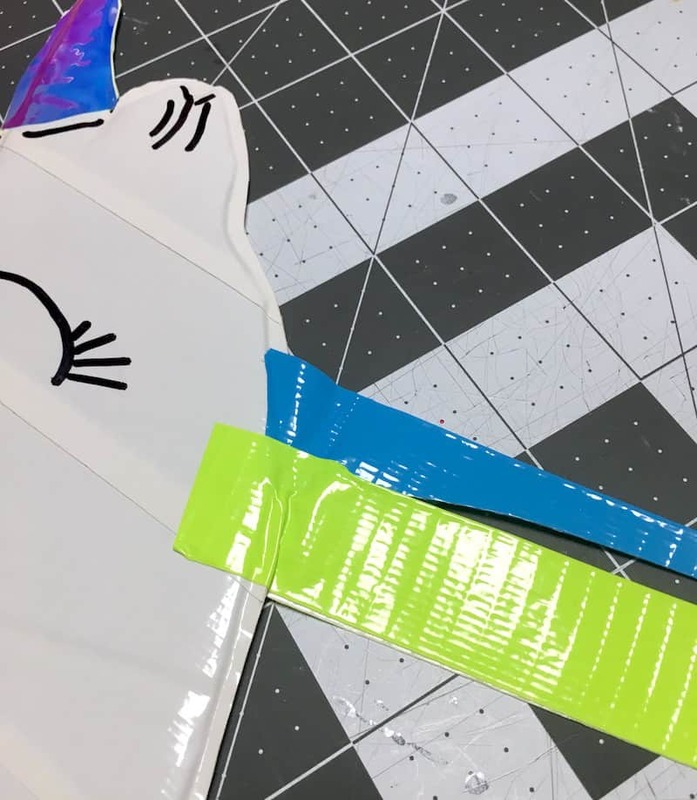 Place the unicorn head down on your craft mat and tape over with white Duck Tape. Flip over and cover the other side with Duck Tape too. Trim the head out with a pair of scissors. 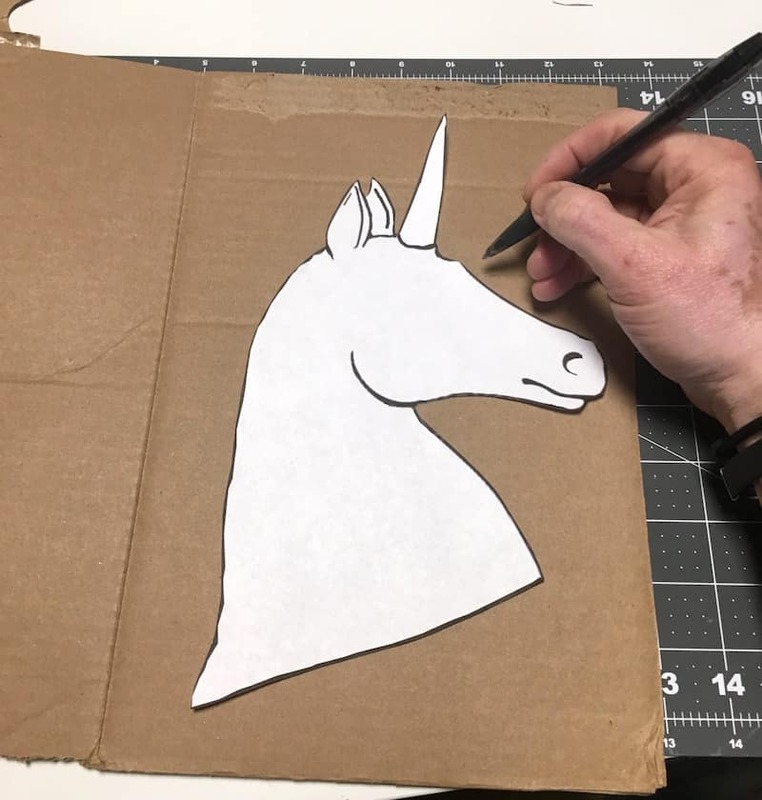 Draw a cute face on the unicorn head with a Sharpie as shown. Let dry (so it doesn’t smear) and then flip over and repeat on the other side. 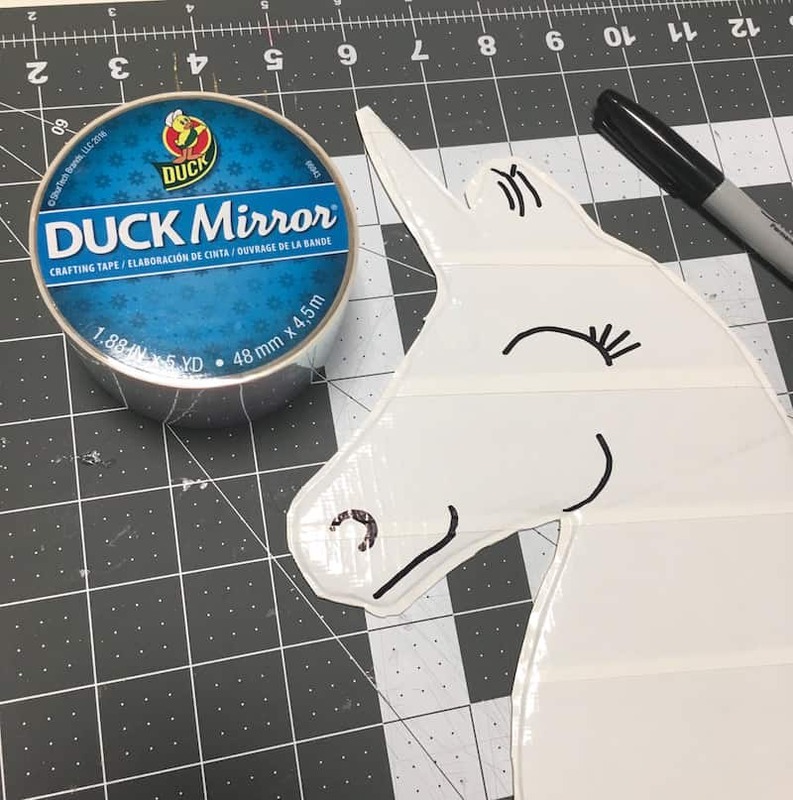 Now you get to use your Duck Mirror Craft Tape! Cover the horn portion and cut out. Don’t you LOVE the way it looks?? It’s so shiny and fun!! You’re going to use the remaining colors of Duck Tape on the mane and tail. Let’s start with the mane! 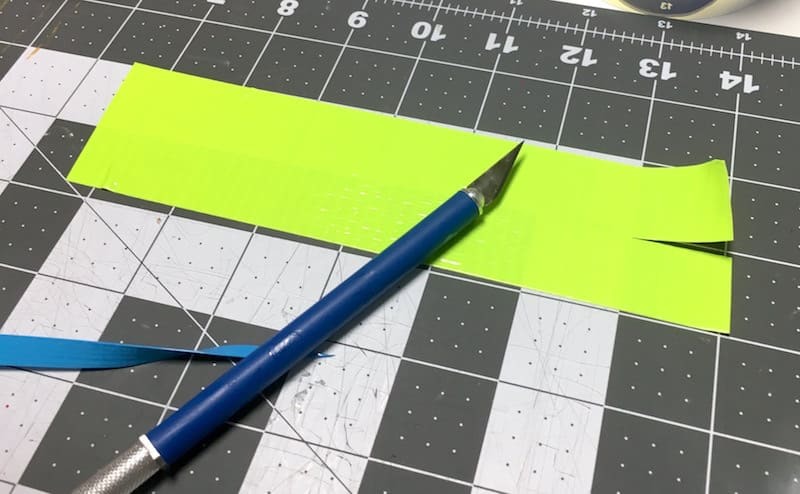 Lay a piece of Duck Tape (about 7 1/2″ – 8″) down on the craft mat and cut a 1″ slit in the middle at one end as shown above. 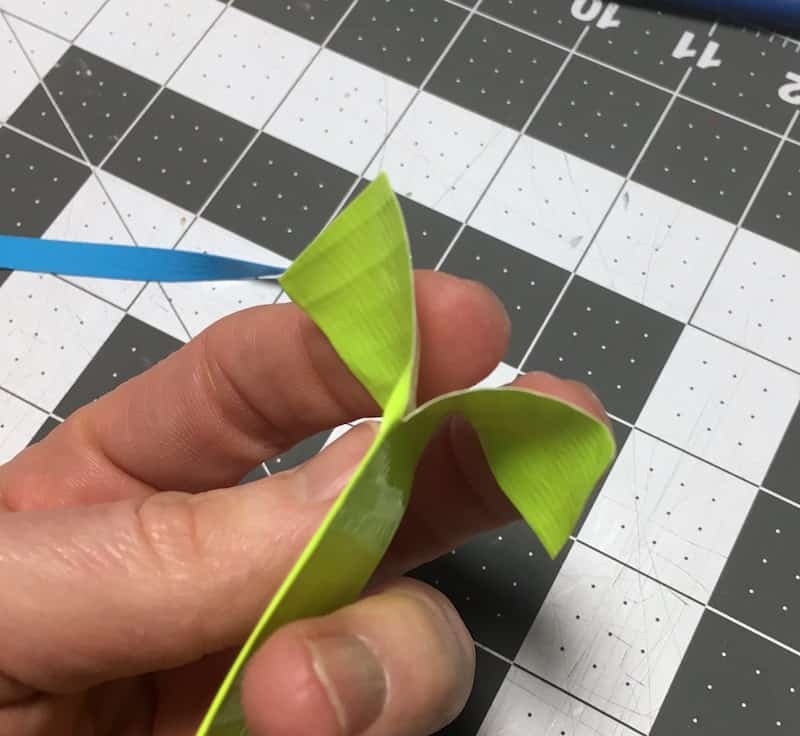 Peel the tape up and fold it over but DO NOT close the end with the slits. Use those two flaps to attach the mane piece to the head and trim carefully with a craft knife or scissors. THEN use scissors to cut a wave into that piece of tape so it looks more like horse hair . . . and repeat. Finish the mane that way. One you are done, insert the head into the box. 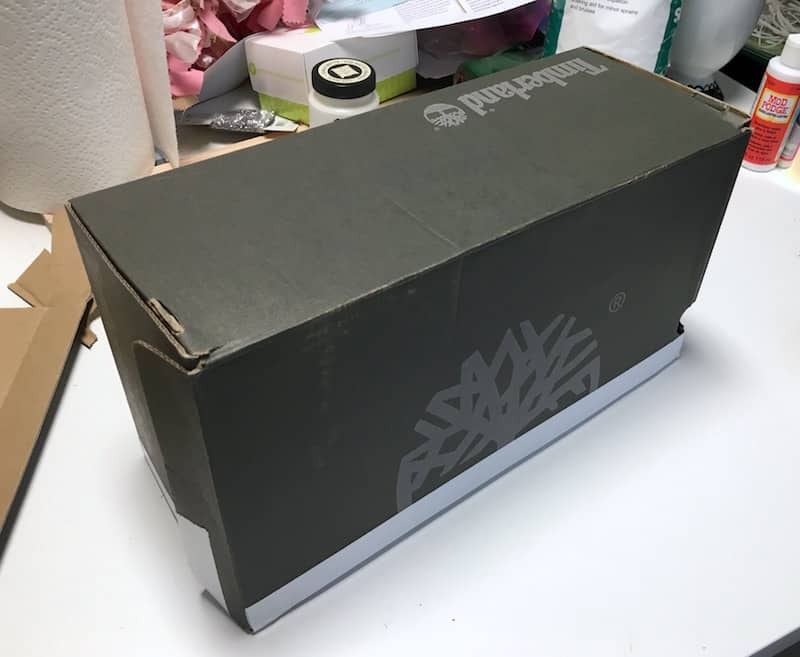 Open the box and fold the tabs opposite ways and tape down if you need to secure. 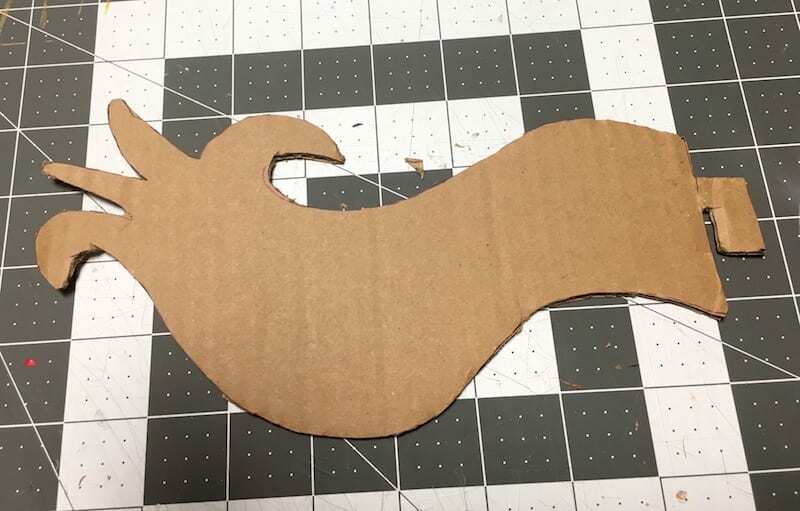 If you haven’t already, use the tail template to cut the tail piece out of cardboard. You’ll want to make a tab here too. 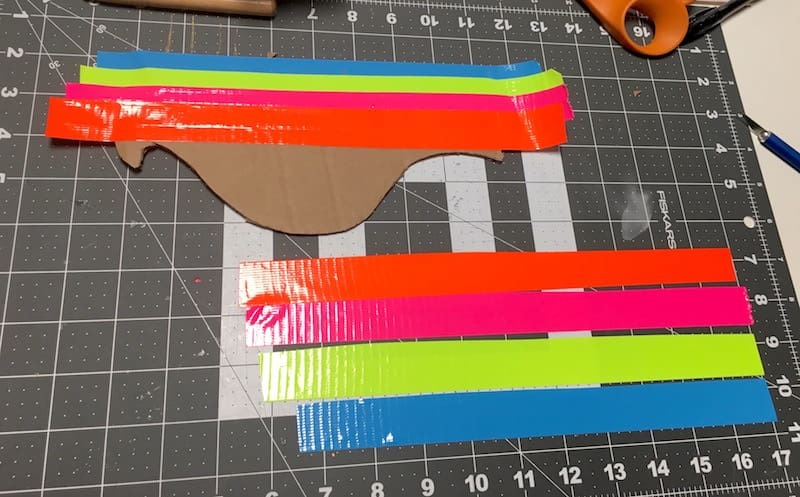 Cover the tail pieces with 1″ thick pieces of Duck Tape (this means you’ll have to trim the Duck Tape pieces down by approximately 1/2). Trim out the tail with scissors. Cut slits into the back end of the box and insert the tail piece. 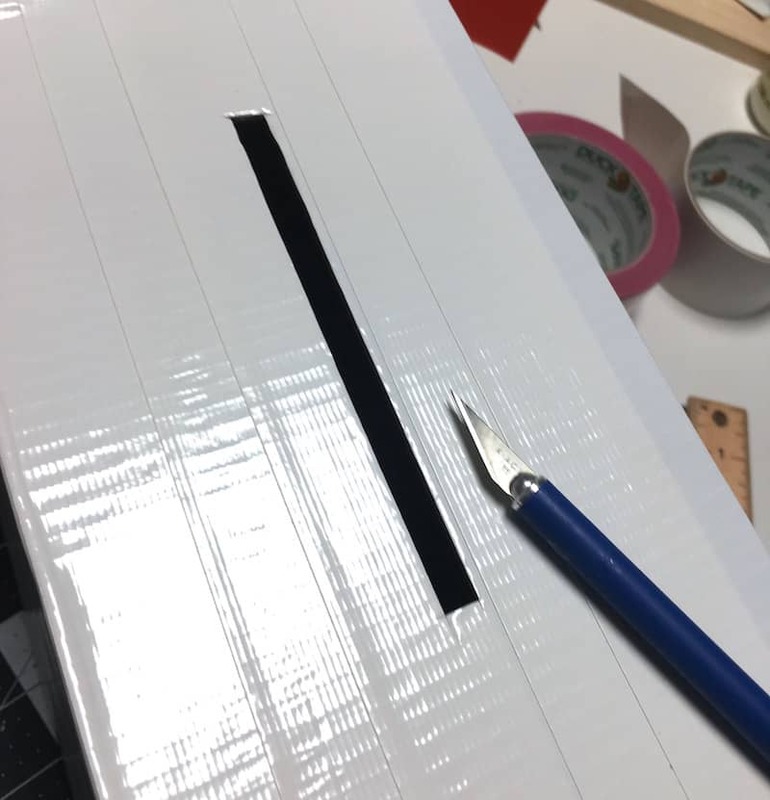 Cut a slit into the top of the box. This is where the valentines will be inserted. You can line this opening with pink Duck Tape like I did if you like! 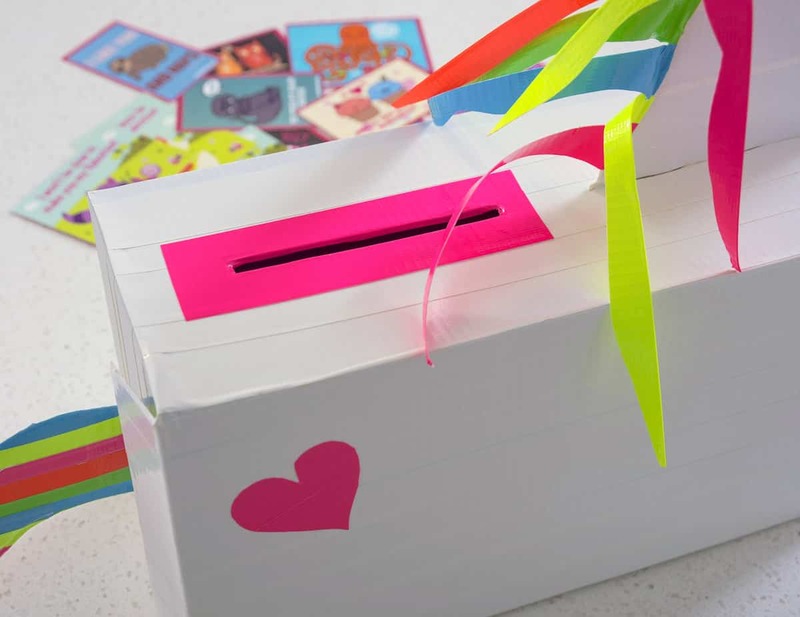 You can add any kind of accents on the side of your unicorn valentines box that you like! I added a heart on each side. 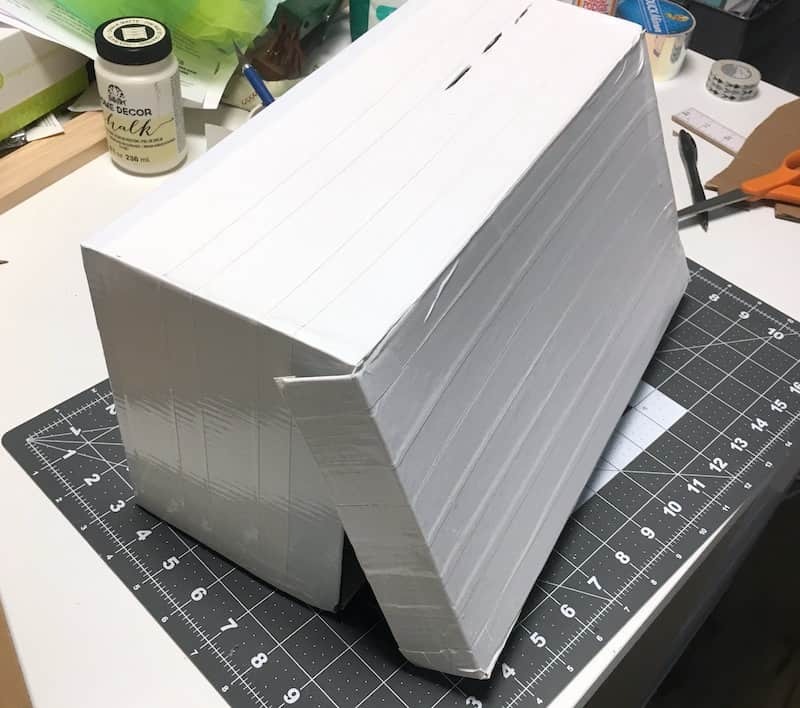 What do you think of my unicorn valentine box?? Isn’t it fun?! It’s ready to receive TONS of valentines! Happy Valentine’s Day. 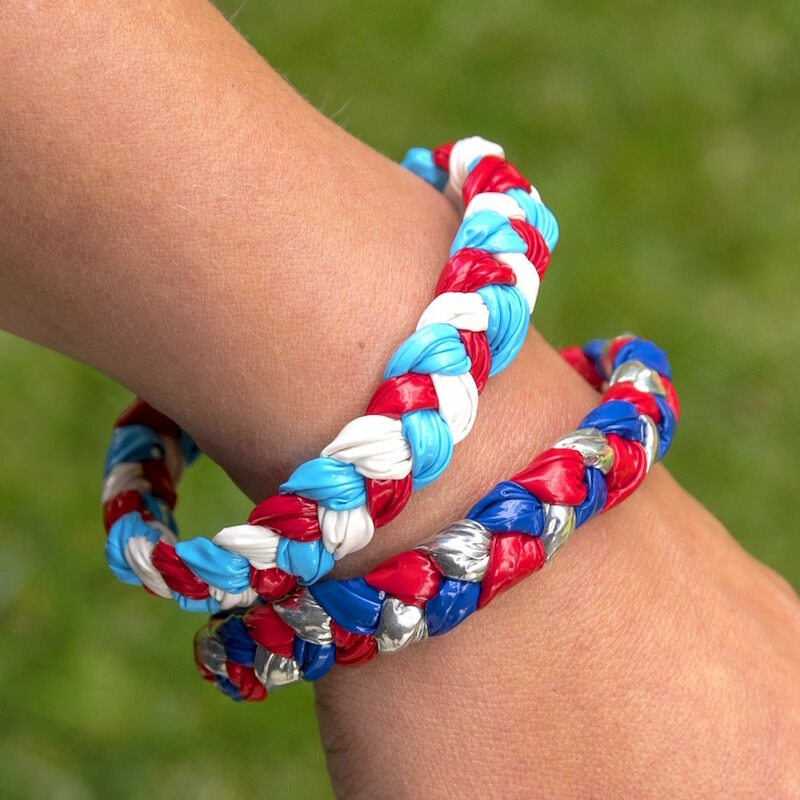 Let us know if you make this project in the comments! Disclosure: I’m working with Duck Brand as an ambassador for the year. While I am compensated for my time, all opinions are 100% my own and honest – I absolutely love Duck Tape!